Whether we had a rough day at work or are just going through a tough time, our minds can be full of judgment and negativity. In order to overcome these thoughts, it’s important to remember that we can ask for help through spirit. 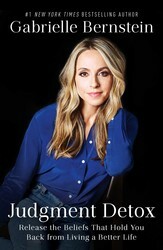 Invite love back into your consciousness with tips from Gabrielle Bernstein, author of JUDGMENT DETOX. It’s time to take judgment off the altar and replace it with love. The profound act of surrendering your fear and judgment to the care of your inner guide will change the way you live. When you come to accept that you can transcend negativity whenever you choose, you’ll begin to know a new form of freedom and happiness. You begin a dialogue with the nonphysical support that is always available to you. But you cannot access this guidance without inviting it in, so when you pray, you invite the presence of love into your consciousness. To help you establish a prayer practice of your own, I’ve offered some of my favorite prayers. You may find that one prayer in particular resonates with you. When you pray, you send an invitation to spirit to help you restore your judgmental thoughts back to love. Spirit is the voice of our right-minded self; it’s where we turn when we feel caught up in fear and judgment. When we pray to spirit, we ask for help to undo our mind’s decision to judge. As we become aware of our judgmental thoughts, we must return to our decision-making mind and choose again through prayer. We don’t have to ask for help regarding specific problems. As I mentioned earlier, you shouldn’t. For instance, don’t go to spirit with questions like whether you should take a certain job or leave a certain relationship or which car to purchase. To do so would be a misunderstanding of how we are meant to ask spirit for help. When we ask for specific help (which boy, which car, and so forth), we’re arrogantly assuming that we know what the problem is and then demanding that spirit answer us in the form that we have set up. Most of the time, though, we have yet to discover the root cause of the problem. Asking spirit to answer a specific but ultimately incorrect question is of no help. Therefore, instead of praying for a specific outcome, we must ask spirit to help us return our thoughts back to love. The secret to prayer is to forget what we think we need and surrender to spiritual guidance instead. Guide your mind, body, spirit with yoga for cleansing.